Fur Trade | This is home. A few weeks ago, as Mel and I were returning from my nephew’s birthday party in northern Wisconsin, I suggested we make a side trip. We were in no hurry to get home, so Mel agreed. “Where are we heading?” she asked. “Sandy Lake; it’s near McGregor.”I replied. Instead of heading out of Duluth on Highway 2, we took Highway 210 to McGregor, then turned north. We saw no signs indicating any historical sites ahead but I thought there had to be something commemorating the place in Minnesota’s history. I got on my smart phone (Mel was driving) and googled Big Sandy Lake. Just as images of historical markers popped up, we happened by those very markers along Highway 65. 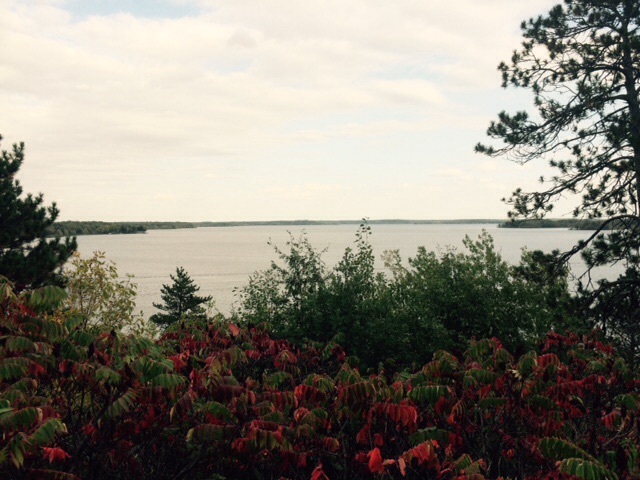 The markers are located at a wayside rest with a beautiful view of the lake. For some reason, the wayside rest was barricaded off, but we parked on the shoulder and walked in. I was surprised to find a detailed description of the Sandy Lake Tragedy that pulled no punches regarding the white leaders involved. 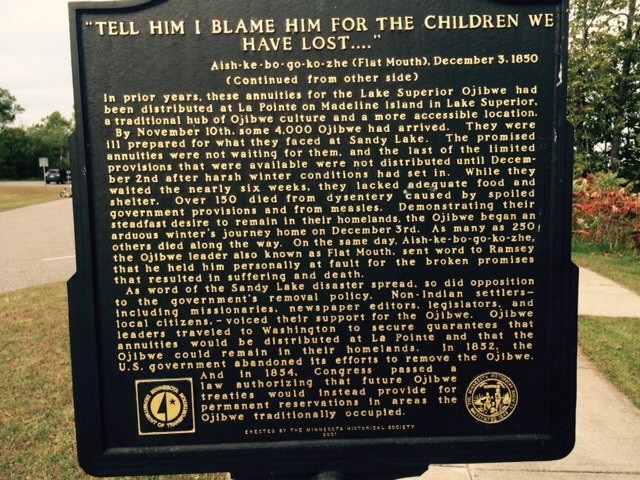 The marker clearly describes the motives of Territorial Governor Alexander Ramsey and how the Ojibwe were wronged. High school history classes in Minnesota discuss Ramsey as a prominent figure in the state’s formation. I wonder whether his role in the Sandy Lake Tragedy is talked about in those history classes…. We continued north toward the area where I read the old trading post was once located. Another surprise: a well-maintained recreational area at the outlet of the lake. The Corps of Engineers maintains a flood control dam at the outlet and has developed an attractive park, including more historical markers. 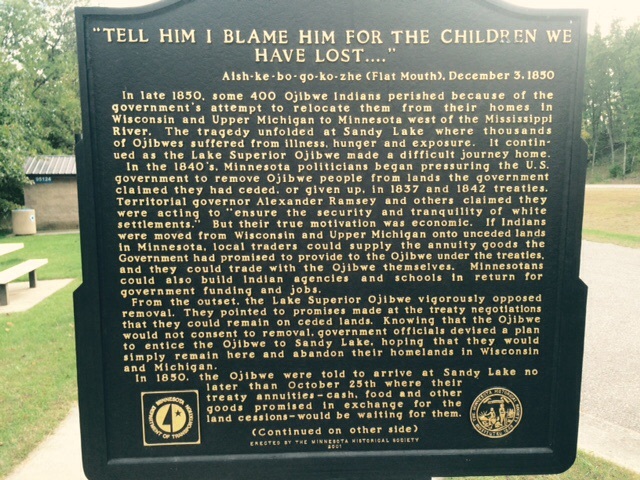 The most recently installed marker, commemorating the Sandy Lake Tragedy, was established by descendants of the victims representing several Ojibwe tribes. Called the Mikwendaagooziwag Memorial, it stands on a small knoll that also is home to a very old cemetery. 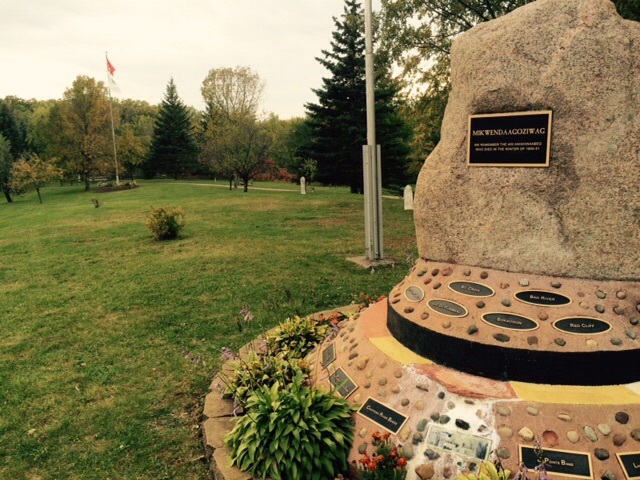 Based on the information on all the markers, it became clear that the main Ojibwe village was located here or very close nearby. The missionaries Frederick and Elizabeth Ayers established a mission here in 1831, and later moved it to Fond du Lac in 1834. Interestingly, the Ayers missionary life paralleled the journey of our family. Prior to Sandy Lake, the Ayers served at LaPointe, and they later appear in the 1849 territorial census somewhere north of Little Rock Lake, as the nearest neighbors to Antoine Blair. Whether there this is coincidence or there is a real connection between the Ayers and our family depends whether Alexander Blair was French Canadian or Scottish. If he was from Scotland, he would likely have been Presbyterian, like the Ayers. On the other hand if he was French Canadian and Catholic, he and his family would have had very little to do with the Protestant missionaries. 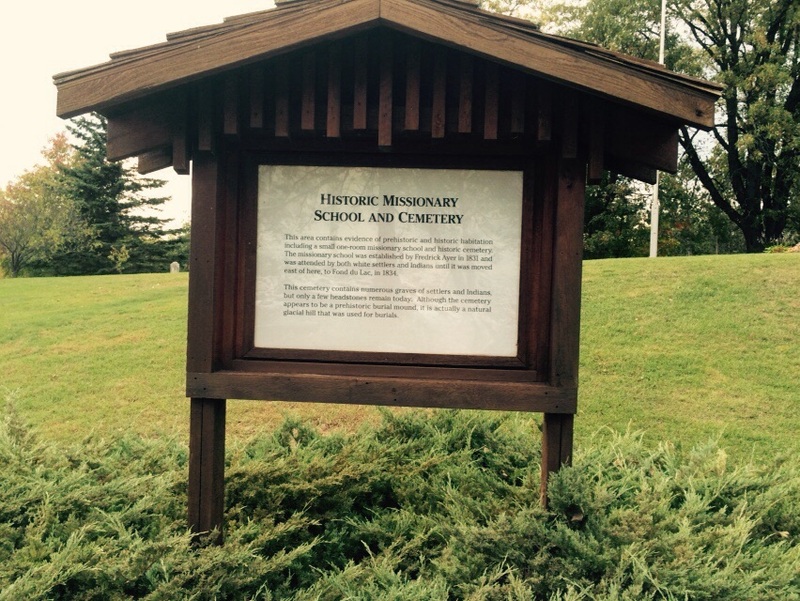 According to the historical marker on-site, the cemetery includes Indian and non-Indian graves. The marker clearly points out that, although the small hill resembles a burial mound, it is a naturally occurring glacial feature. Only two gravestones remain, both of which are dated in later settlement days. As I reflected on this information, it occurred to me that Alexander Blair and other members of our family may have been buried here. Given its strategic location on the portage between the Mississippi and the St. Louis River and Lake Superior (Savannah Portage State Park is located near the lake’s northeast corner), one can imagine this area bustling during the height of the fur trade. 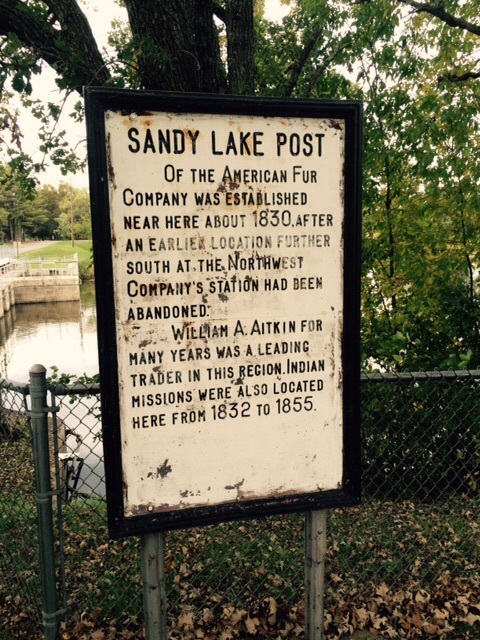 Early American explorers, including Zebulon Pike, Stephen Long, William Cass and eventually Henry Rowe Schoolcraft, all stopped at Sandy Lake to rest and re-supply. The members of our family who lived here witnessed a very important era in Minnesota’s history. The same can be said for the family members who later settled at Watab, which will be the subject of my next post. On June 27, 1839, a man named Pierre Trotochaud entered the United States from Canada (according to a “Declaration of Intent” filed ten years later to become an American citizen). Pierre was born in Maskinonge, Quebec around 1815. Maskinonge, located between Montreal and Quebec City on the St. Lawrence River, was one of the communities where the fur trading companies recruited voyageurs, at least in the early days of the fur trade. Whether or not this practice still was occurring in Pierre’s day, furs were still being moved along the St. Lawrence and opportunities to work in the fur trade were still available to young men looking for adventure. Unfortunately, the location where Pierre entered the U.S. is not known and could have been any number of places. However, having read up on the history of the Great Lakes region at that time, and having identified the places where Pierre later showed up in and around Minnesota, I think there are three main ways Pierre could have entered the country. One was at Ft. Michilimackinac, which was an important port of entry for the fur trade at that time. Michilimackinac was located on an island in Lake Huron, at the mouth of the St. Marys River, which flowed out of Lake Superior. Trade goods moved through Michilimackinac, up the St. Marys to Sault Ste. Marie and on to Lake Superior. Trade goods and people were moved across Lake Superior largely by small boats called bateaux, which were wooden, approximately 40 ft long and rowed by a crew of 5 or more. Occasionally these boats were fitted with sails. Birch back canoes were also still in use, mainly for shorter trips along the coasts. In those days, the American Fur Company dominated the fur trade in the Great Lakes region and had its headquarters at La Pointe on Madeleine Island off the southern shore of Lake Superior. The company had docks, warehouses and stores located in La Pointe. According to the journals of Henry Rowe Schoolcraft, approximately 800 people called Madeleine Island home in 1832. Schoolcraft estimated that only about 150 members of the population were Ojibwe. With the exception of a handful of “white” employees of the fur company, the remaining population were “half breeds”. These were the sons and daughters (and grandsons and granddaughters) of unions between mostly French Canadian men and Ojibwe women. Such marriages were encouraged by fur company officials and if not encouraged, at least tolerated by Ojibwe leaders to facilitate trade. If Pierre did not come through Michilimackinac, it is possible he arrived in Minnesota by steamboat. In those days, the head of navigation on the Mississippi was St. Peter’s Landing, below Fort Snelling. He could have boarded a steamboat in Prairie du Chien, a fur trading center on the Wisconsin side of the river, or perhaps he boarded at St. Louis, also a major trading center. Many other French Canadians who entered the US at that time landed at St. Peters. This brings us to the third theory of Pierre’s arrival. He may have relocated from the Red River Colony, traveling what would soon become one of the Oxcart Trails. French and Scottish Canadians were recruited to settle the colony, located near present-day Winnipeg, by Lord Selkirk and others, beginning in the early 1800s. Floods, grasshopper plagues, isolation and other problems made life in the Colony very difficult and led to many of the settlers returning to eastern Canada or emigrating into the US. Whether Pierre arrived by land or by water at St Peters, he would have found a few makeshift dwellings around the fort and not much else. The inhabitants were mainly French Canadian and mixed blood hunters, trappers and traders. Around that time the US Army began its efforts to move all civilians off the post property. The Army was concerned about a possible Indian attack, did not completely trust the mixed bloods and did not want their dwellings to provide cover for attackers. In 1840, the Army finally removed the remaining squatters by force and burned their buildings. One of those forced out was “Pigs Eye” Parrant, who was just getting his tavern business started. The place downstream from the fort where he relocated was the beginnings of a village originally named Pigs Eye, which later became St. Paul. Regardless of how Pierre came to what is now Minnesota, it seems clear that he was involved in the fur trade. Given he was about 24 years old, it is possible he began working when he was much younger, perhaps in a warehouse back in Canada. That may have led to a similar job at La Pointe. Alternatively, he may have met and gone to work for one of the major players in the fur trade, who were often conducting business in and around Fort Snelling. These would have included Henry Sibley, William Morrow Rice (who also arrived at St. Peters in 1839), and others. His work in the fur trade led to meeting a mixed-blood woman from Sandy Lake named Angeline who would be his wife.